Sometimes all you need is a little kayak that allows you to enjoy the water. Most kayaks on the market that fit into the category of short recreational sit-on-tops are literally just little barges that are no fun to paddle. When I started working on the Tsomo design, I wanted to fit as much speed and comfort into the short length as possible, while still allowing it to carry a decent weight. The Tsomo hull is based on the same concept as the Kasai hull, but I have tweaked it substantially to make it efficient at such a short length. The hull is very wide in the middle for stability and weight-carrying capacity, while the ends are narrow for speed and tracking. Don’t let this kayak’s width fool you, though. 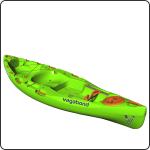 The Paddle Cutaways on the deck work like a charm to make paddling comfortable without bashing your paddle against the deck. In fact, I’ve made sure that this boat is easy-to-paddle for children and shorter people, which makes it a great option for families who want one boat that can be shared. I added a huge Tankwell in the stern, as I can imagine people wanting to use this boat for picnicking. The large tankwell also works great for crates, for which I added square indents to hold crates in position. The tankwell is a winner with the canine members of the family too. The deck comes complete with the Paddle Rest and Bottle Holder that features on all our rec sit-on-tops, as well as the sturdy and adjustable Footrests that are used in most of our boats. Two Handles on each side plus handles on each end makes it very easy to handle this boat off the water too. If you are the type of person for whom paddling is more about having fun on the water right here, right now, rather than using your kayak as a means to get to a destination, then all you need is the Tsomo.